Omschrijving: Canada’s Boreal Forest is dense with life. Richly populated with plants, birds, animals, and trees; home to hundreds of communities; and a wellspring of fresh water and oxygen, the Boreal has long been recognized as a critically important ecosystem. But as rising temperatures threaten to destabilize the planet, the potential of the Boreal’s carbon-rich expanses to mitigate global warming continues to be underestimated. 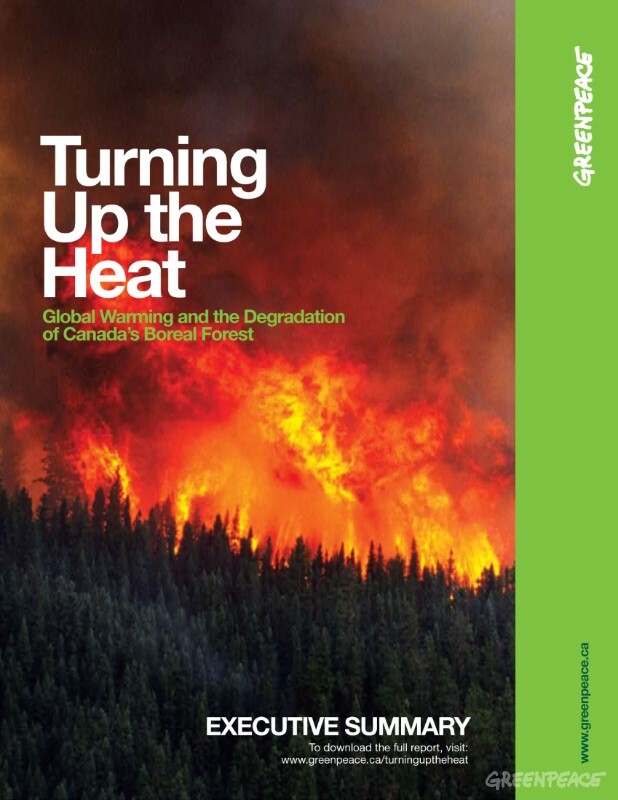 Based in part on a comprehensive review of scientific literature by researchers at the University of Toronto1, this report examines the complex relationship between global warming and Canada’s Boreal Forest. It finds that the intact areas of the Boreal are not only actively helping to slow global warming, but are also helping the forest itself to resist and recover from global warming impacts. These unfragmented areas are also helping trees, plants, and animals to migrate and adapt in response to changing climate conditions. At the same time, however, it finds that logging is destabilizing the Boreal Forest in ways that may exacerbate both global warming and its impacts. The forest products industry and government regulators adamantly deny that logging in Canada’s Boreal affects the climate. But research shows that when the forest is degraded through logging and industrial development, massive amounts of greenhouse gasses are released into the atmosphere, and the forest becomes more vulnerable to global warming impacts like fires and insect outbreaks. In many cases, these impacts cause even more greenhouse gasses to be released, driving a vicious circle in which global warming degrades the Boreal Forest, and Boreal Forest degradation advances global warming. If left unchecked, this could culminate in a catastrophic release of greenhouse gasses known as “the carbon bomb”. For these reasons, the report concludes that greenhouse gas emissions must be drastically reduced and that intact areas of Canada’s Boreal Forest must be protected—for the sake of the forest, and for the sake of the climate.